Today we’re talking about this delicious and healthy Garlic Parmesan Herb Zucchini. This Garlic Parmesan Herb Zucchini is a great healthy side dish option that is ready to serve in only 15 minutes. Fresh sliced zucchini is tossed with flavorful herbs, garlic powder, freshly grated parmesan cheese and olive oil. Then it’s grilled on a stove-top grill pan until tender and delicious. My favorite side dish is macaroni and cheese. There. I said it. My favorite side dish is far from healthy but I absolutely love it. I always make it for special occasions and holidays. I always request it whenever it’s a side dish option at a restaurant. Whenever Ken and I visit a BBQ j0int, I scour the side dish menu. If macaroni and cheese isn’t listed, well then that BBQ place doesn’t live up to my standards. Hello. Doesn’t everyone in the world know that macaroni and cheese is a must have side dish with BBQ? Although my love for macaroni and cheese is strong, I try not to make it too often because whenever I do make it, I eat a ton of it. I’ll sneak spoonfuls of cold mac and cheese right from the refrigerator. No heating necessary when you’re one of the world’s biggest fans of mac n cheese. On the average day, I make healthy side dishes for Ken and I. Our favorites include baked or grilled sweet potatoes, roasted brussels sprouts, and grilled or sautéed zucchini. This zucchini boasts flavor to the max. The combination of dried basil, dried oregano, freshly grated parmesan cheese and a hint of salt and pepper boosts it over the moon in taste comparison to any other zucchini dish I’ve ever tried. I made it twice over the weekend, if that gives you an idea of how much I love it. It’s easy to make – all you need is a grill pan, a stove and about 5 minutes of your time for cooking purposes. You could cook the zucchini on a gas grill by using a non-stick shallow grill topper. We grill zucchini on the gas grill all the time but lately, due to the rain, I’ve been using my stovetop grill pan. In a mixing bowl, toss together zucchini, oregano, basil, garlic powder, parmesan cheese and salt and pepper. Drizzle with olive oil and toss to coat. Place the zucchini on the grill pan and cook 2-3 min per side. Cook in batches, if needed. Remove from the pan and place in a serving bowl for serving. 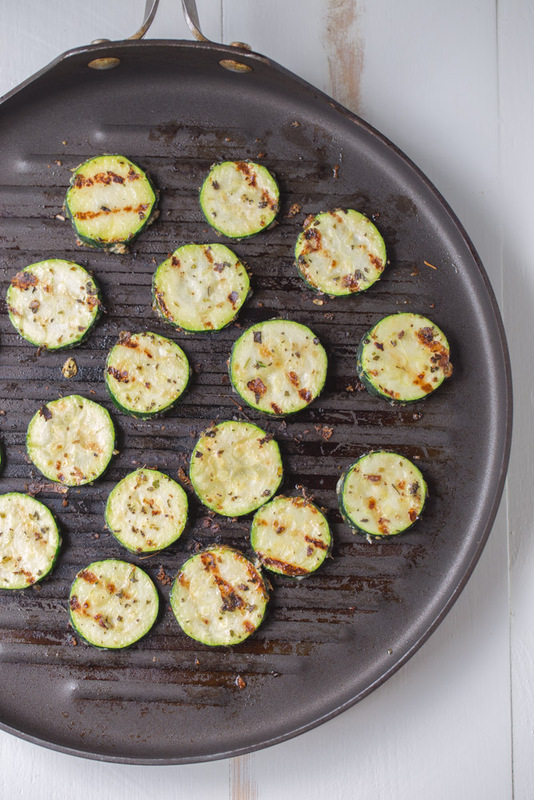 I love zucchini on the grill, but I love that you used a grill pan so that we can enjoy them anytime of year! I love keeping recipes simple with fresh produce so this is right up my alley! I have an abundance of zucchini right now so I will definitely be trying little cuties! Mac and Cheese is one of my favorites too =) Ain’t no shame in the cheese game! Mac n Cheese is one of my favorites too. I always make it for the holidays, I figure it is allowed. I have an overflow of zucchini and have been enjoying them in everything over the last week, so this will be added to the round up. Maybe even with dinner tonight! Haha, I know the feeling!”what’s your favorite Mexican dish”? I don’t know, ALL OF THEM! Thanks for stopping by, Tina! Hi Julie! I found your blog via Florian’s! 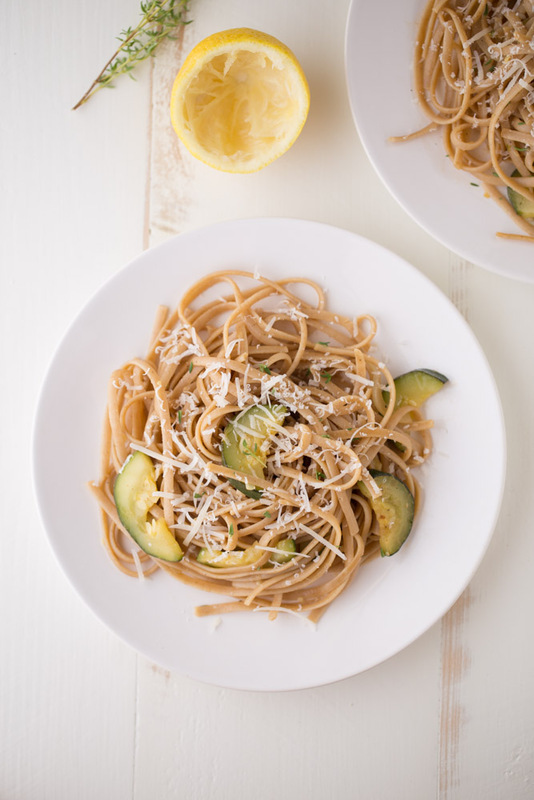 I love zucchini and usually use it to make zucchini noodles – my current favorite way to eat it. 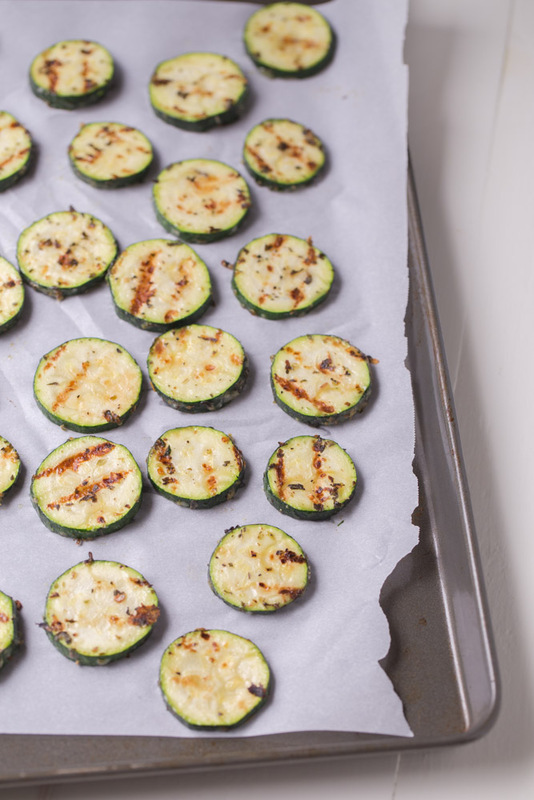 But I’ve never made grilled zucchini… thanks for the idea! I have lots of zucchini from my garden and am always looking for new ways to use it up. This looks so easy and the perfect summer side! It’s a great summer side, Julia! You should make this zucchini and macaroni and cheese! True story, all of the talk of mac n cheese with this post had me craving it. So I made some to go with dinner tonight. :) Thank you so much for stopping by and for the pin, Mira! This is perfect for all the summertime squash! One can never have enough zucchini recipes!! Side dishes are my favorite, I can make a meal out of them alone. This looks perfect, Julie! Love the flavors and how easy it comes together! This looks SO SO SO yummy! Also, I think everyone’s favorite side dish is mac and cheese :). If I could make one unhealthy food healthy, it would probably be mac and cheese! Oh yum!! I still have more zucchini in my fridge, left over from the ones I didn’t turn into fries and I was thinking I wanted to do something simple with them. But, simple doesn’t mean I wanted to sacrifice the yum! And these are absolutely PERFECT! Love the garlic-Parmesan-Italian herb seasoning, and that you grilled these (grill pans rock!). Most definitely making these! I love mac n cheese too… but really, it’s creamy and cheesy- show me the nuts-o that doesn’t like mac n cheese so I can check their forehead for a fever! But, I tend not to make it all the time.. mostly because the Hub will ONLY eat stove top mac. And sometimes this girl wants baked mac, because i like the crispy bits… so then I’m stuck with a HUGE vat of mac n cheese. And that is tooooo dangerous!! Oh, and I totally agree with you, if a BBQ joint doesn’t have mac on their menu, I am OUT! :) Cheers, girlie! And thanks for sharing this- now I can stop fretting over what to do with that zucchini! *5 Stars* I don’t know why I can’t click on your stars at the bottom :( It will only let me click one.. and hello- this NEEDS 5 stars!! Bawhahaha, I know, who doesn’t like mac and cheese?! I love baked mac and cheese. Luckily, the boyfriend does, too. It’s his favorite way to enjoy it. He loves the crispy panko topping on it. Try story, I ended up making some to go with dinner tonight. I just couldn’t resist after all of this talk of mac and cheese! Glad you enjoyed this recipe, Cheyanne. I’ll have to try to figure out why you are unable to click the stars. Thanks for the heads up! I’m think we could combine mac and cheese and these zucchini and make it an EPIC side dish, yes? Who can resist mac and cheese? It is the best kind of comfort food. While I do love pasta and cheese, I try to eat healthier options whenever possible and love these zucchini slices. 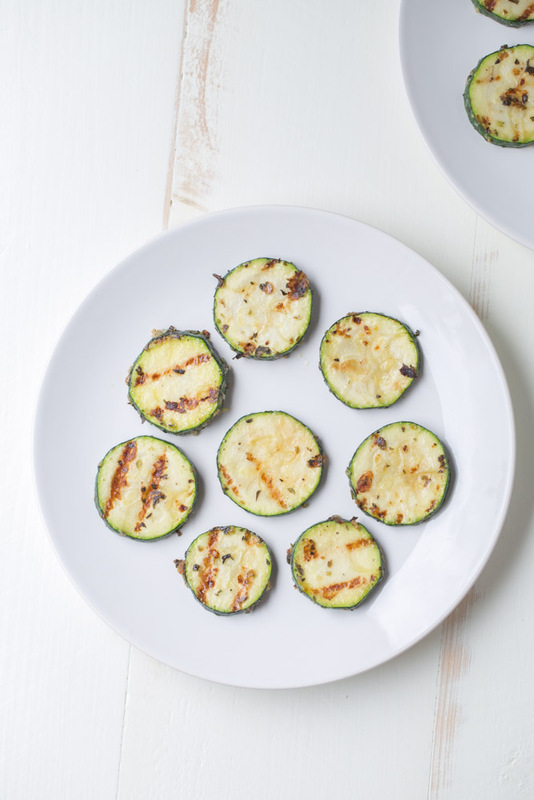 I have a bunch of zucchini in my garden right now and can’t wait to try these for dinner! I don’t think anyone can resist mac and cheese, Ashley! I know I can’t…I made some for dinner this week. I was craving it after all of this talk of mac and cheese. :) Hope you enjoy the recipe, Ashley! I completely agree with you about BBQ and Mac and Cheese! This zucchini looks great, not too heavy and full of flavor. Thanks for sharing on Snickerdoodle Sunday! Pinned and Tweeted.